Container Gardening - Small space vegetable and herb gardening. Container Gardening Ideas for edible plants. Growing container gardens can provide you a steady crop of home grown veggies, herbs and edible flowers, even in small spaces. Gardening in containers is a method of growing plants and vegetables in containers instead of directly in the ground. This type of gardening is ideal for anyone with limited space, time, resources or mobility. Growing plants in containers is a simple process. Decide on the plants you want to grow. Purchase or find a suitable pot or container. Add a highly nutritious soil that drains well while holding adequate moisture. Set your pots in an area that receives the appropriate amount of light for your selected plants. Set up a regular feeding and watering schedule. A container planting can be as simple as growing herbs in containers on a kitchen windowsill, or as elaborate as a grotto of planters, large pots with trellises, and raised beds filled with a mixture of edible and ornamental plants. If you intend to grow only one variety of plant per pot you can tailor each pot and it's soil specifically to the needs of that plant. When you're planting different plants in the same pot choose plants that like a similar environment. 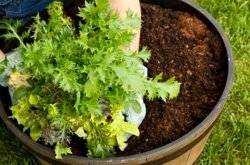 For example, when growing herbs in containers choose herbs that have similar soil, water, and light requirements to ensure that each of the plants have their individual needs met. The size of container you choose for your garden will depend on a number of variables such as the size of your plants at maturity, how many plants per pot and whether the plants have shallow or deep roots. A plethora of containers exist to make any container gardener happy. 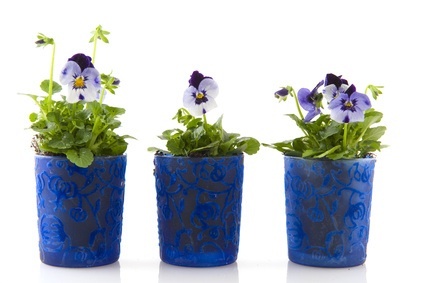 There are the usual containers such as plastic and ceramic flower pots but any vessel that will hold the soil together can be adapted to perform as a plant container. Insulated planters look like stone but are extremely lightweight. These planters have the added advantage of keeping delicate roots protected in the winter. Insulation extends the outdoor growing season in colder areas and reduces watering times in hot weather. Specialized planters that allow you to grow plants that hang upside down are great space savers. Most containers will need more frequent watering than a large bed. Depending on the size and materials of the container, on very hot days they may require watering twice daily, particularly if the container is small, shallow or constructed of wood, unglazed clay or other porous material. You can buy meters that give you a readout of moisture conditions but the good old finger test is as good a gauge as any. Insert your finger 2 to 3 inches into the soil to test for moisture. Garden centres sell a vast array of sizes and shapes of pots, bins and barrels that can be planted. Look for lightweight and classic designs like the Toscana that comes in sizes as large as 24 inches for some serious container gardening. The bigger the planter, the fewer watering issues you'll have and the more plants it'll support. Tips for places to look for unique containers include farm auctions, garage sales, classified ads and e-bay. Windowsills, patios, greenhouses, sunrooms and rooftops are all spaces where plants can live happily in confinement. A small 4 foot by 4 foot space is ideal for raised bed gardening. Plant the garden using a square foot gardening strategy for the highest yields possible. Senior citizens and other individuals with mobility issues will enjoy a raised bed garden that is built on platforms that are 2 to 3 feet tall. This reduces bending and allows for those in wheelchairs to access the garden. Because containers are relatively small it's easier to alter conditions like soil quality, light intensity and weed growth. A daily inspection will reveal any issues that need to be addressed. Fruits, berries, vegetables and herbs can be successfully grown in containers, alone or partnered with similar plants. Special strawberry pots can be used to give small plants their own space. 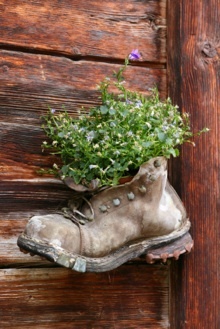 Often, container gardeners grow a variety of plants in the same pot creating gardens with a common theme. Salad, shade, herb and vegetable gardens can all be grown in containers. To ensure that all of the plants have a chance to thrive, plants with common needs for water, light and soil conditions should accompany each other in the same pot. Many edible plants are as visually appealing as they are tasty. Exotic and tropical fruits such as dates, bananas, lemon, oranges, limes and olives can be grown in containers. Bring them indoors during cold weather, add grow lights to increase indoor light and use a paintbrush to help pollinate the flowers. They will produce delicious fruit for you to enjoy within a year or two after planting. Container cultivating adapts very well to organic gardening methods due to the high degree of control you can have over a container's environment. Container gardens are usually kept close to the house making watering, weeding and general coddling a simpler task. Your container garden will have a few needs that must be met. An adequate sized container for the mature plants and light, soil, nutrient and moisture conditions must all be considered for the health of your garden. Other than that, the sky's the limit. Inside or out, floor or table, big container or small, growing green at home can be as creative as you are!